One thing about these batteries: they discharge fairly quickly when not in use. It's rather irritating to have charged a battery a week prior, popping it into your camera, and finding it almost dead already. That's a good data point to add to the story, Rohith. Thanks for that! Third party batteries can be hit or miss -- it all depends on how long it's been on the shelf before you buy it. But in terms of value for $, they're much better than the OEM batteries. My personal experience has been that not only do my third-party batteries last less long, they also tend to run out with little or no warning from the camera's battery indicator. When using the Olympus battery, the camera always gives a warning when the battery is on its last legs. With the third-party batteries, sometimes I'll see two bars in the indicator, and just a few shots later the camera abruptly stops working because the battery is completely dead. That's not merely inconvenient. On two occasions I've had cards corrupted because the battery died completely during a write cycle. I realize it's possible to adjust the low-battery threshold by adjusting Item 9.742 in Custom Menu XZ347 or whatever, but I don't want to screw up the indicator for use with my Olympus battery. For now I'm stuck because of the ludicrous scarcity of the Olympus batteries, but I'm looking at my third-party substitutes strictly as a better-than-nothing solution. 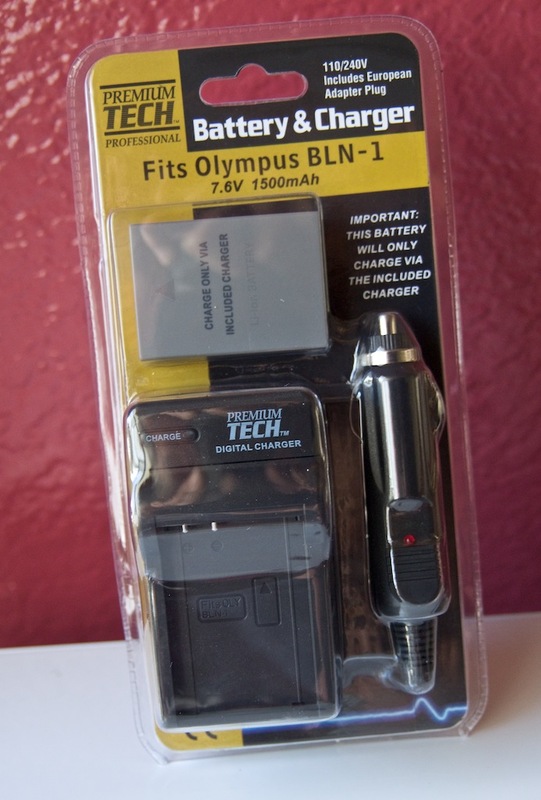 Can you charge the Olympus BLN-1 battery with the 3rd party charge? You would then have only one charger. Yes, the Olympus battery can be charged in the clone charger, but then the Olympus battery will only have about 90% of its full charge capacity. The reason is the Olympus battery has a higher voltage when fully charged, and the third party chargers are not able to supply that level--the clone batteries can't take it. When I'm traveling I take both chargers, less convenient but I need to in order to get the full benefit of the Oly batteries. I actually have an EM-5, grip and three Oly batteries and two 3rd party batteries, so this is a direct response to the post and not just general 3rd party battery experience. 1. I too use the 3rd party battery in the camera body and the Oly batteries in the grip. I swap out and recharge the 3rd party battery in the body weekly, so it works fine as a backup. 2. Another reason I use the 3rd party batteries in the body is that they are too snug of a fit in the grip and difficult to get out--but fine in the camera body. 3. How did I get three Oly batteries you wonder? Well it's a case of shopping regularly at my local camera store. I might pay just a bit more than from a web purchase, but they still give me good prices (How about 10% off on the extra batteries when they could have probably sold them to someone for more than RRP as they are so rare). And when I told them I was on the lookout for batteries, they saved the first extra for me as it came in from delivery. The second one was from an OM-D EM-5 demo camera when they found a spare battery at another outlet. They gave me the choice of the demo battery or wait for the spare to be transferred to them the next day. As the OM-D EM-5 had only been out for a week at the time, I just took the demo battery as it had probably only been charged once or twice and it saved me a trip back to the store. They also gave me 10% off RRP on the 75mm, the 45mm and my grip because I was a regular customer. They only had one 75mm and called me when they got it to see if I wanted it before they put it out. There is great value in building a working relationship with a local dealer.